Fiction – Kindle edition; Harper Collins; 400 pages; 2017. Review copy courtesy of the publisher. Meet Eleanor Oliphant, a 30-year-old single woman, who lives in Glasgow and works as a finance administrator in a design firm. She has no family and no friends. Her life is guided by routine: lunchtimes doing the crossword puzzle in The Telegraph, evenings in front of the TV, and weekends spent at home consuming two bottles of cheap vodka. Then there’s the regular Wednesday night phone call with “mummy”, who is locked up in an unspecified facility (read jail) and badgers her daughter about her “special project”. That special project, it turns out, is Eleanor’s plan to woo a man she’s been admiring from afar: a rock singer she thinks is “the one”. But when that project goes off the rails, Eleanor’s fragile grip on life (and reality) threatens to derail more than just her one-sided romance. This astutely written debut novel by Gail Honeyman is quirky and humorous and deeply affecting. It goes into some very dark places, but emerges with a strong feeling of hope and optimism for the future. 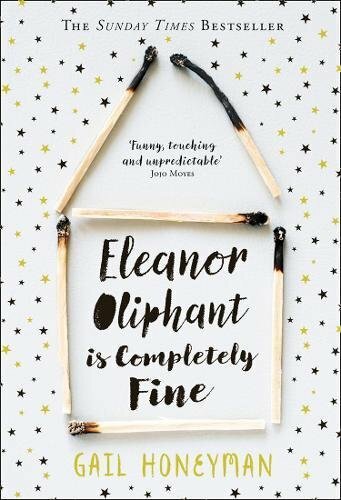 Its central character, the eponymous Eleanor Oliphant, is an oddball: she lacks self-awareness, finds it difficult to make friends, is socially awkward and yet she’s never afraid to do her own thing. The last party I’d been to – apart from that appalling wedding reception – was on Judy Jackson’s thirteenth birthday. It had involved ice skating and milkshakes, and hadn’t ended well. Surely no one was likely to vomit or lose a finger at an elderly invalid’s welcome home celebration? But balancing out the snide laughs and the eyeball rolls is a sense of pathos and empathy, as the author oh-so casually and ever so slowly offers a steady drip feed of information that forces the reader to constantly reassess their opinion of this opinionated narrator. We know that Eleanor struggles to fit in, but when we discover early on in the book that she has a badly scarred face, there’s a sudden “a-ha” moment. Other hints about a dark past and the ongoing strained relationship with her mother, makes the reader want to know more: how did Eleanor’s injuries occur? Why does she have to see a social worker? Why is her mother locked up? Why does she feel the need to dampen down her feelings with so much vodka? All these questions combined with exemplary narrative pacing makes Eleanor Oliphant is Completely Fine a proper page turner. Forgive the capitals – and the book reviewers’ horrible cliché — but I COULD NOT PUT IT DOWN. As you will undoubtedly know if you’ve read my blog for any length of time, I usually run the other way when the bandwagons come along, but this book really is as good as the hype. It might be slightly too long, and Eleanor’s voice takes a while to warm to, but once you’re in the throes of the story it’s hard to resist its charms. I predicted most of the plot turns, but it’s such a genuinely thoughtful, kind-hearted and touching novel I didn’t really mind. I loved its perceptive examination of loneliness, the human need for companionship and the ways in which the past can continue to haunt the present and the future. But overall I loved the message that you cannot live your life by a timetable: change, spontaneity and daring to try new things are much more important. ‘I don’t see her as a Take a Break reader, somehow. It’d be something much weirder, much more random. Angling Times? What Caravan?’ ‘Horse and Hound,’ said Billy firmly, ‘and she’s got a subscription.’ They all sniggered. I laughed myself at that one, actually. This sounds lovely – I like the idiosyncratic voice and its good to know its heartwarming rather than sad at the end, I’m not in the mood for sad endings at the moment! It’s certainly gripping. It does venture into some very dark places, but you come away from it feeling that Eleanor is going to be OK…so inasmuch as it doesn’t deal with cheery subjects it deals with them in a relatively cheery way. I’m not a great one for bandwagons but maybe this time I’ll make an exception. When you first mentioned Eleanor’s behaviour I wondered if she had Aspergers. There are definite characteristics there which would fit the bill. The facial scaring would also fit but perhaps both are an issue? Without trying to diagnose Eleanor, I think you’re right: I think she does have some form of autism. Be interesting to know whether the author intended that or not. There’s a different explanation for the facial scarring, but I won’t reveal that here. I really enjoyed it, Lisa, but I was looking for something easy to read because there’s so much else going on in my life. This fit the bill perfectly. Yes, all good here, my bandwidth just can’t cope with much reading or blogging at the moment because of work. I do love my job but because we’re a start-up with just two employees it means I wear about seven different hats and work longish hours to get everything done. Am hanging out for Christmas and at least 10 days off! Gosh, that sounds demanding. Hang in there! How serendipitous—I literally just finished this today! I agree with you; it’s a bit long and the voice is sometimes too much (though I found it worked the other way round, it was fine in the beginning and became a little too noticeable as the book wore on), but it’s such a bloody lovely thoughtful open-hearted way of looking at the terrible things that can happen to people, big and small, that it hardly mattered. It really does deserve all of the love it’s received. Oops… am a bit behind in responding to comments! Glad you enjoyed this one as much as me. I thought it was a lovely warm book about an horrendous subject done with its heart in the right place. Likewise—great to put a face to the name! And I totally agree; heart in the right place, difficult material well handled. I’ve seen this loved by so many bloggers that I might actually pick up a copy if I see one now. Shock, horror! I used to be a Take A Break addict, myself: I’d do all the comps and send them in by post in the 90s. Never won a thing. Not a thing. LOL re: Take a Break. Hope you get to read this book at some point. It covers some very dark territory but it’s done in a refreshing, big-hearted way, which has the odd effect of making it all the more powerful. I definitely think this one deserves all the hype – and praise – it is getting. I couldn’t put it down and loved how surprisingly humorous it was. That said, in the end it didn’t quite work for me. Maybe it was just a little too tidy and hopeful an ending to be believable? What I did love was how it explored loneliness (though I’d love to see that done without such a dramatic backstory as to why the person is lonely). Yes, it’s not a perfect book, but it’s refreshingly different to most “dark” books out there. I, too, loved the way it explored loneliness and I agree: it would be wonderful to see the subject tackled in a slightly less dramatic way. I’m trying to think of other novels I’ve read that explore loneliness and the first one that springs to mind is Kent Haruf’s Our Souls at Night — have you read that one? With some books, you just can’t avoid using a cliche or two. It sounds like the hype for this book is well deserved… I’ll have to add it to the library list! I think you’d like this one, Naomi. It was the first one I read post-Shadow Giller — I wanted something quick and entertaining (!!) to read, and this went down as smoothly as hot chocolate. I must read this. Everyone seems to love it – I do own a copy! I haven’t come across any bad reviews either and part of me was (admittedly) intrigued as to whether it could be an good as everyone says it is. Guess what. They were right! Pleased to hear the audio version was read in a Scottish accent! And glad to hear you liked the book. It seems to attract such mixed reactions.